Last week, we reported that Google made the new "Did You Mean" feature a standard. Meaning, Google's search spelling suggestions are now acting in this new manner. The issue is, many are complaining that they are getting killed by this. Some have e-commerce sites and this is resulting in Google dropping their position by at least two placements, due to showing the new "Did you mean" feature. 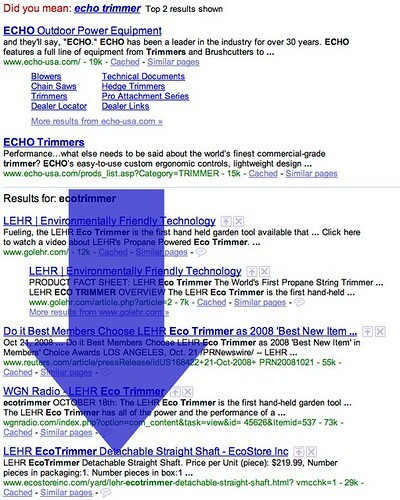 One example is brought by a webmaster in the Google Webmaster Help forum, who says a search for ecotrimmer returns this "did you mean" feature and pushes his site down to a much lower position, resulting in a huge sales slump for this business owner. As you can imagine, this is not the only webmaster impacted by this change.